To make whipped cream, you'll need about 1 tablespoon of sugar and 1/2 teaspoon of vanilla extract per 1 cup of heavy or whipping cream. Try any of the following methods to make the whipped cream, depending on the equipment you have available in your kitchen. Whip the cream and sugar using an egg beater until soft peaks begin to form. Add the vanilla, and whip until stiff peaks form. Whisk the cream and sugar in a bowl vigorously until it begins to form soft peaks. Add vanilla and continue whisking until the cream forms stiff peaks. Combine cream and sugar in the bowl of a food processor or a blender. Turn the blade on and watch carefully until the cream thickens and forms soft peaks. Add vanilla and process for a few second longer to form soft peaks. Place cream, sugar, and vanilla in a jar and take turns shaking the jar until the cream thickens. 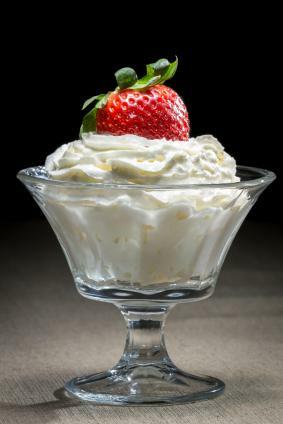 Refrigerate your cream for at least 12 hours before whipping, and take it out of the refrigerator right before you whip it. The colder everything you use is, the better success you'll have with your cream. Refrigerate your bowl, whisk, blender jar, or egg beater blades until just before use. Over beating leads to lumpy whipped cream, or even starts the formation of butter. Watch cream carefully to avoid over beating. It can turn to butter very quickly. What happens if you make too much whipped cream? If you store it in a bowl, you may discover the next day that the cream has separated and there is a layer of water in it. A more effective way to store the whipped cream is to place it in a wire colander and hang the colander over the edges of a large bowl. Cover the entire bowl and colander with plastic. This allows the water to drain into the bowl, keeping the cream fresh and usable for a day or two after whipping.